Madathikkavu Bhagavathi Temple is located in Pooppathy, Thrissur dist, Kerala State, South India. The main diety here is godess Kali. 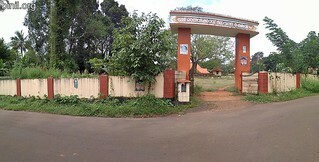 Its around 44 kms from Thrissur town, 21kms from Kodungallur, 18km from Chalakudy, 5km from Mala, 20km from Angamaly. The origin of this legendary temple dates back to the 17th century – around 300 years ago. It’s history is closely intertwined with the lords(thampurans) of the erstwhile Kodungallur Kovilakam(the palace of the local kings). That was the time when the Kochi rajah (under whose rule lived these lords) was under frequent attacks from the Zamorins, the ruler of the neighbouring princely state, kozhikkode. Kodungallur was one of the special targets of their attack, which, literally drove them out of the area. When it was almost certain that the zamorin’s army would force an entry into their premises, they left the place. Ardently devoted to Devi Kurumba of Kodungallur, they were the most hurt when they had to take leave of her, thereby depriving themselves of the diety worship and poojas[rituals]. As a way out, they carried with them the sword invoked with her divine spirit[chaithanya] to rather an obscure hamlet called Pooppathy where they settled down and they continued with their offerings and poojas in the presence of the sword. This phase ran upto a few decades during which they kept ‘the holy sword’, first in the court yard of Thamarassery Mekkat Mana[a prominent Namboothiri family of the locality], and then, in the ‘madhom’ which was used as their granary. Once the political turmoil and the subsequent instability ended, these lords returned to Kodungallur. But, it is believed, that the sword refused to be stirred out of the place. ‘Prasna’ [a kind of astrological calculations to know the divine will] was conducted and the ‘oracular’ revelation was that it was ‘Her’ will to stay back. That was why and how a temple was constructed, as it is seen now, by the then seniormost member of the Thamarassery Mekkat Mana[presumably Sri Sankaran Namboothiripad, who was a predecessor to 4/5 generation]. Devi’s holy spirit from the sword embedded in a ‘valkannadi’ [a mirror-like idol] was ceremoniously placed[prathistha] in the sanctum sanctorum and the temple was consecrated. Please check out other temples in this site.